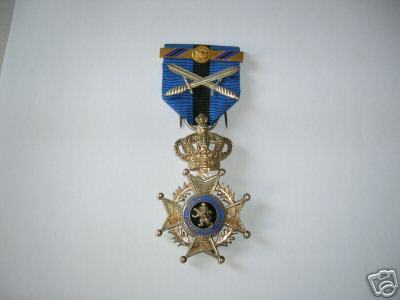 A Knight of the Order with a Palm leaf and the letter "A", would this be for WW1 or is it a made up one? 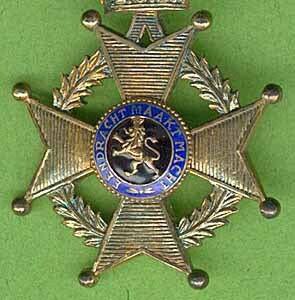 Not the Order of Leopold but as Guy already posted one a Military Decoration, is it a 2nd class or is it missing the chevron like Guy's has? To get this thread back upon the right track, here is one op my knight badges. 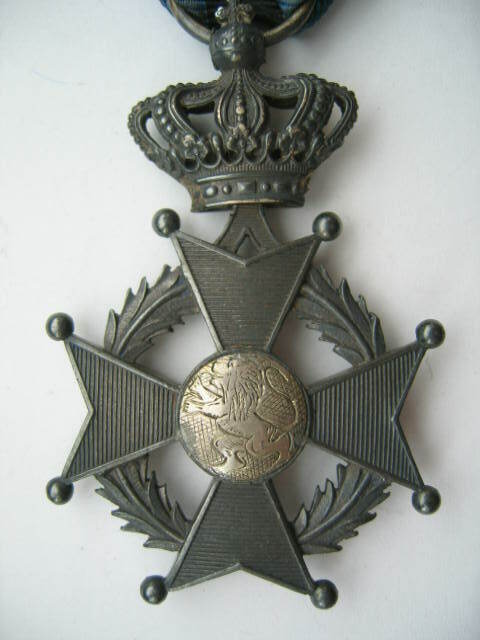 This one belonged to a Flemish WW1 soldier, who clearly a was Flemish nationalist, because he tore off the centre medaillon with the French inscription "l'union fait la force" and engraved a flemish lion in its stead. And yes, let's split the thread so it will get the attention it deserves!! Only that this one tells you way more about the recipient than any other "un-altered" ones one might in his collection. I would not turn it down if it was offered to me. Do you know the recipient? a strange one with caracter! I like it. Just to help clarify things for me, the Knights level with the WW1 palm, would that have been issued to a civilian for bravery, because there are no crossed swords? Or could it also be issued to a soldier? No, they were given to soldiers, for bravery in the field. The crossed swords come later, every 10 years, to keep the memory alive, the government offers a "promotion" to veterans who have accumulaterd a certain amount of points. These points are calculated through the time spent in the trenches and the awards won. These promotion orders are distinguishable from the others through the application of swords. two officers made by Wolfers (crossed arrows). A Flemish one and an official French one. Thanks for those 2, I am going to have to find some Flemish only ones. And where would I find these "crossed arrows"
where would I find these "crossed arrows"
That's stange, becouse I have the french Officer in the order of Leopold II wich is marked with the arrows and is in a Wolfers box. 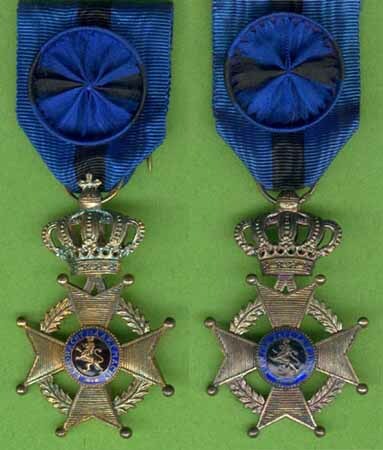 I have a knight in the order of the crown wich is marked with the arrows and is in a box from Wolfers and I have a real golden miniature of the workersmedal wich is marked with the arrows and sits in a box of Wolfers. Can you give me an explenation for this? 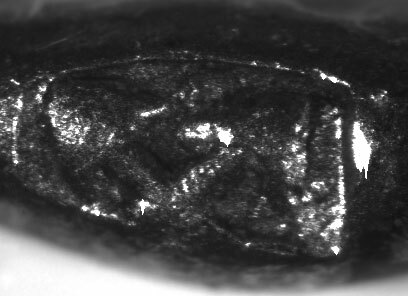 For those who can't make out that makers mark I've outlined it. So what is this one? Is it legit or made up? 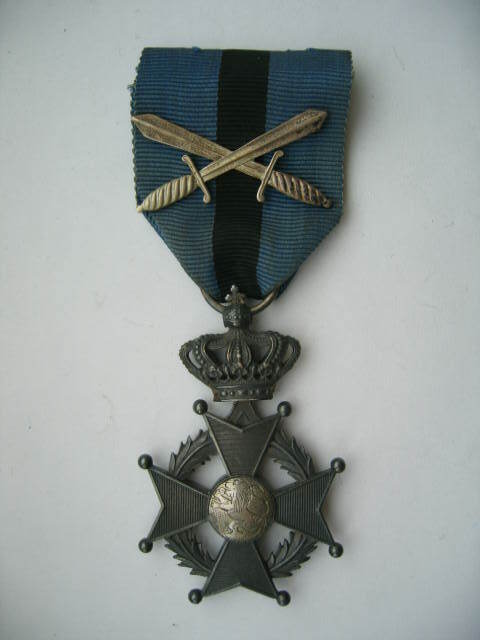 The knight cross is given for actions in the 1st World War, for ancienety in the administration or the army or for other reason this person recieved the golden medal in the Order of Leopold II, with is lower in rank than the knight degree, for that reason a bar with the miniature of the golden medal was placed on the ribbon of the knight cross. Cool Thanks Guy are these seen often? I saw a few in collection, but to be honnest I never saw a recipent wearing it.